How can I set inkjet ink that I've already painted onto cotton? Flowable Extender is a medium-bodied clear acrylic fabric paint base. This medium is essential in order to use Chromacryl as a textile paint. Mix 1 part of medium with 2 parts paint to make a printing ink or painting medium. When Textile Medium is used, Chromacryl Acrylics have excellent bonding properties with most fabrics. Heat set the fabric in a normal manner after the design is completely dry, using a hot iron. 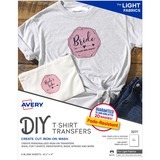 Create your own iron-on transfers using an ordinary clothes iron, most software, your inkjet printer and Personal Creations T-shirt Transfers. T-shirt Transfers are designed for white or light-colored, 100 percent cotton or polyester/cotton fabrics. I hand painted a stretch cotton top with some inkjet ink several years ago, on a whim. The fabric was not prepared in any special manner. I have not washed out the ink, it is just dried on there. Sometimes I wear it and get covered in ink. It's sooo funny and toxic, but i do love the colours and design. Do you know of any way of setting the ink to any degree? I have been wondering if it would work to saturate the shirt with a vinegar solution and heat in a sealed zip-lock bag in the microwave for several minutes. What do you reckon? Don't try the vinegar/microwave method! It won't work. Vinegar will not set the inkjet pigment on cotton; in fact, vinegar won't set anything on cotton. It works to set acid dyes on silk or wool, but not inkjet ink, and not cotton. I don't think there's any way to set these colors as dye. Depending on the printer, inkjet ink is composed of either disperse dye, which can be heat-transferred to polyester, or insoluble pigments, which can't be used as dye on any fiber. What you can do instead is use a clear, colorless fabric paint to seal the color in. Like any fabric paint, the colorless variety will slightly alter the hand of your fabric, but there are some that do so only to a minor extent. Don't use a regular artist's medium, such as is used to make paints for use on paper or perhaps on walls; you must use a special fabric medium, which is made to be less stiff and less scratchy. The acrylic paint base you buy should be labeled specifically for use on fabric, or have the word "textile" in its name. There are different brands of colorless fabric paint extenders. They are often sold for mixing with fabric paints to dilute them, as diluting with too much water will result in there being too little glue present to help the pigment to stick. Fabric paint extender is the same colorless acrylic base to which pigments are added in order to make fabric paint. You will need to do a test with any fabric paint extender you obtain, to make sure that it works as you hope it will. You'll want to test whether that it is sufficiently transparent, and that it doesn't feel bad on the fabric. Paint some on to a cloth rag that is similar to your inkjet-painted cotton top. Check the manufacturers' instructions to find out how much water you can add safely (for fabric paints made by Jacquard Products, you can add only up to 25% water), and to make sure whether you need to heat-set the product after it dries. Some brands of colorless fabric paint medium or extender include Jacquard Neopaque Flowable Extender (sold online in Australia by Batik Oetoro, in New South Wales), Setasilk 30 Diluant (sold online by Silksational in New South Wales), Jo Sonja's Textile Medium (sold online by The Thread Studio), and Uniprint Extender or Hand Painting Medium (sold online by Kraftkolour in Victoria). In her 2008 book Quilts of a Different Color , published by the American Quilter's Society in Kentucky, Irena Bluhm gives a recipe for a mixture of colorless fabric mediums that she uses to seal pigment she has drawn with ordinary colored pencils onto fabric, in making quilts. Her favorite formula is to mix 70% Jo Sonja's Textile Medium, 20% Delta Ceramcoat Textile Medium, and 10% Versatex Fixer. The different textile mediums have different textures, and it is a matter of taste, which you prefer. Delta Ceramcoat is very thick, while Jo Sonja's Textile Medium is thinner. These two textile mediums require heat setting, but the Versatex Fixer allows the use of this mixture with no heat setting at all. You might not be able to locate all of these specific brands in Australia, but I am sure that you will be able to locate equivalent products that will work with a little experimentation. Depending on the amount of inkjet ink that is in the fabric of your cotton top, you might need to paint fabric medium on both sides of the fabric. After you have thoroughly covered the inkjet ink in your cotton top with some sort of fabric medium or fabric paint extender, allow it to air dry, then, if necessary, heat-set the acrylic medium to make it permanent. A home clothes dryer will probably not get hot enough for this, but a commercial dryer in a laundromat will work, or you can press the fabric with a hot dry iron to set the acrylic binder. Your top will probably feel a little heavier, less stretchy, and a little stiffer, but you should be able to wear it without transferring the inkjet ink to your skin or to anything else you touch, and you will be able to launder the shirt, as well. A completely different alternative is given on my page about flower pounding, "How can I set the dye from pounding flowers onto cloth?". What you can do is scan the designs you've painted onto your cotton top, using a scanner attached to your computer. Edit the images if necessary using a photo manipulation program, such as Photoshop Elements, then print them out on to inkjet transfer paper, also known as t-shiort transfer paper. You can then transfer the designs to a new piece of fabric with a hot dry iron. This is a good way to preserve paintings that are otherwise too ephemeral to wear.